Tired of throwing your money away at wrestling seminars just to be told, "You should try-out with one of the Big companies, I think you got what it takes!" ? Well let's see who has the guts to step up to the plate! Calling all female & male Wrestlers, Managers, Valets, Referees and wanna-be promoters. 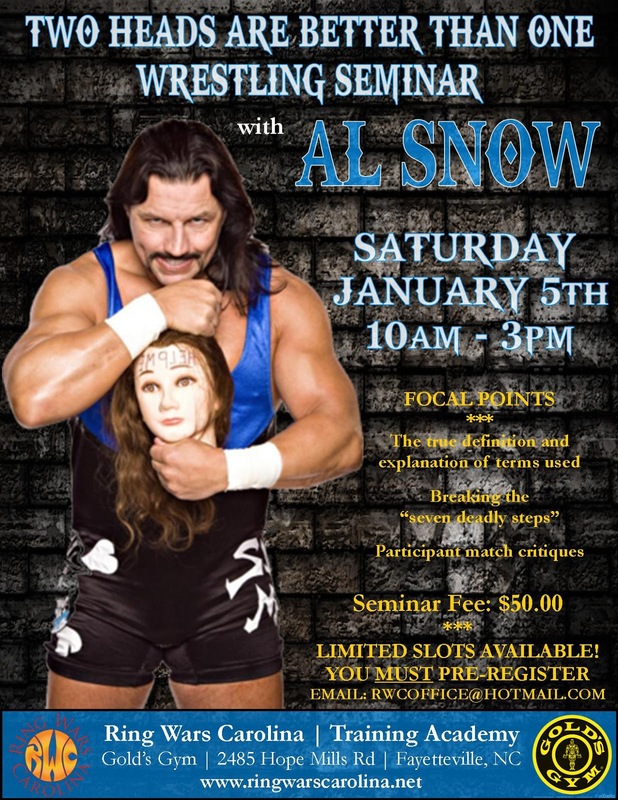 man himself, TNA's Al Snow. Al Snow will be conducting The Wrestling Seminar of seminars. He will be separating the WRESTLERS from the MARKS. You need to sign-up really fast cause there will be limited spots to assure everyone a fair evaluation from TNA's Go-To Guy. If you don't know what that is, please disregard this event! If you do then read on! For 4 hours you will learn from the man who has the ability to spot talent! Don't hesitate! If you're interested, email your inquires to RWCoffice@hotmail.com today! This is the only email address taking reservations. How much you say? $50 dollars secures your spot. It's a great Christmas or birthday present for your favorite wrestler or yourself!